Here is the list of the hotels near Appenai-sous-Bellême. Book your hotel near Appenai-sous-Bellême today, Thursday 16 May for the best price, reservation and cancellation free of charge thanks to our partner Booking.com, leader in on-line hotels reservation. Below here is the list the 50 closest hotels of Appenai-sous-Bellême, sortable according your criteria. You will find the position of these accommodations on the Appenai-sous-Belleme hotels map. Set in Bellême in the Lower Normandy Region, 46 km from Le Mans, Les Après is a Guest House located at 84 km from Chartres. The property boasts a sun terrace and views of the garden. Free private parking is available on site. There is a shared lounge at the property. Homemade meals are available at an extra cost. Bike hire is available at this guest house and the area is popular for hiking. Guest accommodation Bellême Preferred hotel ! Located 1 km from the centre of Bellême, this property offers self-catering accommodation 100 metres from Bellême Golf Course. Free WiFi access is provided in each apartment. Apartments at Les Belleme Golf Apartments are provided with a fully equipped kitchenette, a seating area with a flat-screen TV and a bathroom for each bedroom. Some of them have a view of the golf course. Guests can benefit from discount rates to access the property’s golf course. You can also enjoy walks in the park or visit Le Perche Nature Park, which is a 30-minute drive away. Les Belleme Golf Apartments is accessible via the A11 motorway, which is a 35-minute drive away. Located in Bellême in the Lower Normandy region, Holiday Home Plaisir I is a 3-star property boasting free WiFi. The accommodation is 42 km from Alençon. The holiday home includes 3 bedrooms and a kitchen with a dishwasher and a coffee machine. Located in the heart of the Normandy countryside, the Normandy Country Club is the main hotel located in from of the 18-hole Bellême Golf Course. Hotel rooms and self-catering accommodation is offered at the country club. Studios, apartments and rooms feature a flat-screen TV and a private bathroom with bath or shower. The apartments and studios include a self-catering kitchenette with a stovetop and dining area. An on-site restaurant is open each day and breakfast and lunch are served in the brasserie-style restaurant. You can also enjoy a drink from the bar while using the free WiFi access. The restaurant serves typical and local specialities. Located in a peaceful and green setting, this hotel is the perfect choice for a relaxing leisure break or for business meetings. Family and business events can also be hosted by the property. Le Haut-Val Résidences is an aparthotel located in The Perche Regional Park, 100 metres from Bellême Golf Club. It offers self-catering accommodation ranging from studios to villas. Apartments and studios and the villa all have a bathroom with a bath or shower. Some of them also offer a balcony, and most include free WiFi access. A flat-screen TV is provided in some of the apartments, and the villa can accommodate up to 9 people. Guests are able to cook their own meals at Le Haut-Val Résidence. Each accommodation type includes a kitchen with a stove and a fridge. A garden and a terrace are available at the property and free parking is provided on site. Guests benefit from a reduced rate for the green fee at Bellême Golf Club. Located in the heart of the Perche Regional Nature Park, Belleme Resort offers self-catering accommodation. An à la carte restaurant and a spa are located nearby in another establishment and can be used with an extra cost. With a view of the garden or of the golf course, each accommodation features a private entrance, a flat-screen TV with cable channels, free Wi-Fi access, and the bathroom is complete with a bath or shower. The fully-equipped kitchen includes a dishwasher, refrigerator, stove, microwave and coffee machine. An electric kettle and toaster are also provided. Breakfast is an optional service on site, and can be delivered to the accommodation at an extra cost. Belleme Resort is next to the local golf club, Le Mans Train Station is 53 km away, and free private parking is provided on site. Located in Bellême, Camping Du Perche Bellemois offers accommodation with a terrace or a balcony, free WiFi and flat-screen TV, as well as a seasonal outdoor swimming pool. All units comprise a seating area, a dining area, and a fully equipped kitchen with various cooking facilities, including a microwave, a toaster and a fridge. A stovetop and coffee machine are also featured. The camping offers a barbecue. A children's playground is available on site and cycling can be enjoyed within close proximity of the property. Alençon is 40 km from Camping Du Perche Bellemois. Chateau de la Grand Maison is situated in Bellême. Complimentary WiFi is featured. There is a private bathroom with bath in all units, along with free toiletries and a hair dryer. A continental breakfast can be enjoyed at the property. Guests can relax in the garden at the property. Alençon is 40 km from the bed and breakfast. Bed and Breakfast Saint-Aubin-des-Grois Preferred hotel ! Located in Saint-Aubin-des-Grois, Le Pautonier offers B&B accommodation in a former Percheron horse farm. It offers views of the surrounding countryside and a garden. Nogent-le-Rotrou is a 20-minute drive away. Accessed by a private entrance, all rooms are decorated in a modern style and feature a view of the garden. The en suite bathroom includes a bathtub or shower, hairdryer and free toiletries. A breakfast is provided each morning at Le Pautonier. Guests can also find restaurants 10 km away in Bellème. Additional features include free WiFi access throughout and free private parking on site. An array of activities can be enjoyed on site or in the surroundings, including cycling and hiking. Alençon is a 45-minute drive away. Les Tonneaux du Perche is located in the countryside of Saint-Germain-de-la-Coudre and offers unique B&B accommodation, a garden and a terrace with outdoor dining area. The circular cabins at Les Tonneaux du Perche have tea and coffee making facilities and kitchenware. The private dry toilet and solar shower are located outside the accommodation. A continental breakfast is included in the rate and delivered each morning to your cabin. It consists of homemade jams, yoghurts, cakes and fresh bread. A basket with organic meals prepared with local produce can also be enjoyed, upon prior request. An array of activities can be enjoyed on site or in the surroundings, including cycling and hiking. Free private parking is possible on site and La Ferté-Bernard is 13 km from the property. Located in the heart of the countryside in Saint-Germain-de-la-Coudre, Domeaine de la Haute Poignandiere offers a terrace, garden and table tennis facilities. Bellême Forest is 10 km away. All rooms feature a view of the garden, a flat-screen TV and parquet flooring, while some also have a seating area. The en suite bathroom includes a hairdryer and free toiletries. A continental breakfast serving homemade jam, yogurt and cakes as well as fresh bread is provided each morning. Guests can also request evening meals, as well as a gourmet platter with organic products, homemade terrine and camembert cheese. Access to a shared fridge is provided and there is free Wi-Fi access throughout the property. Mamers is a 30-minute drive away and Bellême Golf Club is 12 km from the property. Guest accommodation Éperrais Preferred hotel ! Set in Éperrais, Le Courlis offers accommodation with free WiFi. Each unit features a living room with a flat-screen TV and a kitchen fitted with a dishwasher. An oven, a microwave and toaster are also featured, as well as a coffee machine. The holiday home offers a terrace. Guests at Le Courlis can enjoy cycling nearby, or make the most of the garden. LeBelforest - Chambre Zen is situated in Éperrais and offers a garden. This bed and breakfast offers free WiFi, a terrace, as well as a shared lounge. A continental breakfast can be enjoyed at the property. Guests at the bed and breakfast can enjoy darts on site, or cycling in the surroundings. Located in Le Pin-la-Garenne in the Lower Normandy Region, this detached holiday home is 35 km from Alençon. You can fire up the barbecue for a tasty meal and enjoy the garden in fair weather. Free private parking is available on site. There is a seating area, a dining area and a kitchen equipped with a dishwasher. A flat-screen TV is available. The holiday home features free WiFi throughout the property. A selection of activities are offered in the area, such as fishing and hiking. Perche Regional Natural Park is 13 km away while Paris is a 2-hours drive from the property. Located in Préaux in the Lower Normandy region, Gite Des Lavandieres has a terrace. Guests staying at this holiday home have access to free WiFi and a fully equipped kitchen. The holiday home comes with a flat-screen TV. Situated in Préaux, in the heart of Le Perche Natural Park, this detached holiday home features a garden with a barbecue. The unit is 13 km from Bellême and 11 km from Nogent-le-Rotrou, and guests benefit from free WiFi and private parking available on site. The house is equipped with a kitchen with a dishwasher and oven. A flat-screen TV with satellite channels, as well as a laptop are featured. You can play table tennis at the property, and the area is popular for horse riding. Guests can enjoy various activities in the surroundings, including cycling and fishing. Le Montgacel is located in Le Pin-la-Garenne. Guests staying at this holiday home have access to a fully equipped kitchenette. This 3-bedroom holiday home includes 1 bathroom fitted with a bath. A flat-screen TV is available. The holiday home offers a terrace. Cycling and hiking can be enjoyed nearby. Alençon is 49 km from Le Montgacel. Set in Le Pin-la-Garenne, Gites La Haute Borde provides accommodation with free WiFi and a garden with a barbecue and garden views. The holiday home provides guests with a terrace, a seating area, a flat-screen TV, a fully equipped kitchen with a dishwasher and an oven, and a private bathroom with shower. A microwave is also offered, as well as a coffee machine and a kettle. If you would like to discover the area, hiking is possible in the surroundings. Located in Nocé in the Lower Normandy region, Chambres d'hôtes de La Chevalerie features a garden. Free WiFi is provided. A continental breakfast can be enjoyed at the property. A babysitting service is also available for guests at the property. Situated in Colonard-Corubert, Haras du Chêne features accommodation with free WiFi, a seating area, a flat-screen TV and a kitchen. Each unit is fitted with a dishwasher, oven, a coffee machine, as well as a microwave and kettle. A terrace with garden views is offered in every unit. The holiday home offers a barbecue. A garden and a children's playground are offered at Haras du Chêne. Guest accommodation La Rouge Preferred hotel ! Set in La Rouge in the Lower Normandy region, La Goglinière has a garden. This holiday home features a 24-hour front desk and free WiFi. This holiday home is equipped with a kitchen, a flat-screen TV, a seating area and 2 bathrooms. The holiday home offers a barbecue. Guests at this property can enjoy cycling and fishing nearby, or make the most of the sun terrace. Set in Saint-Denis-sur-Huisne, Château De Blavou Normandie offers a garden and free WiFi. The guest house provides a French restaurant. Guest rooms at the guest house come with a seating area. All rooms are equipped with a private bathroom with a bath or shower. The units feature a wardrobe. Château De Blavou Normandie offers a sun terrace. Cycling is among the activities that guests can enjoy near the accommodation. Alençon is 48 km from Château De Blavou Normandie, while Verneuil d’Avre et d’Iton is 49 km away. The nearest airport is Deauville – Normandie Airport, 117 km from the guest house. Set in the Regional Nature Park of Normandy, Jardin la Bourdonnière offers a botanical garden, a continental breakfast, non-smoking rooms, and Wi-Fi is free of charge throughout the property. The room at Jardin la Bourdonnière features a seating area, a wardrobe, and the private bathroom includes a bath tub and toilet. The continental breakfast is served daily, and several restaurants can be found just 5 km from the guest house. Jardin la Bourdonnière is 37 km from l'Aigle Train Station, and a swimming pool, horse riding school, tennis court and golf course can be found within 11 km of the property. Hiking trails can be found just 800 metres away. This hotel is located in La Chapelle-Montligeon in lower Normandy, next to the Reno Forest. It offers rooms overlooking the town square with satellite TV and free internet access. Guests can enjoy regional cuisine and a daily continental breakfast at Le Monligeon’s restaurant. Meals can be enjoyed in the dining room by the fireplace, or outside on the shady terrace. Additional facilities at the Logis Le Montligeon include a bar and free on-site parking. Le Montligeon is a 10-minute drive from Mortagne-Au-Perche and is in close proximity to a number of hiking, mountain-biking and horse-riding routes. Bed and Breakfast La Chapelle-Montligeon Preferred hotel ! Dating back to the 17th century, Le bourgis is a traditional house in the Perche Regional Natural Park, 2 km from La Chapelle-Montligeon and a 15-minute drive from Mortagne-au-Perche. Guests can enjoy a 6000m² english garden in this property as well as free WiFi throughout the property. For your comfort, you will find free toiletries in each room. A continental breakfast can be enjoyed free of charge at Le bourgis. An English breakfast can be enjoyed at an extra cost upon prior reservation, at least 48 hours in advance. Homemade meals with fresh local products can be prepared upon prior request. Free private parking is available on site. This bed and breakfast is 41 km from Alençon and 35 km from Verneuil-sur-Avre. Le Bistrot des Ecuries is set in Rémalard. Guests may enjoy the free WiFi. Verneuil d’Avre et d’Iton is 49 km from the bed and breakfast. Located in Cherreau, Au Jardin de Lisa provides accommodation with free WiFi and a garden. There is a fully equipped private bathroom with shower and free toiletries. A continental breakfast can be enjoyed at the property. The bed and breakfast offers a terrace. Guests can also relax in the shared lounge area. This hotel is situated in the countryside, next to Nogent-le-Rotrou, capital of the Perche region. The Hôtel du Perche and its staff are pleased to welcome you. The air-conditioned guest rooms feature satellite TV, Wi-Fi access and a telephone. The en suite bathrooms include a hairdryer. The hotel has a private car park and you can enjoy a drink from the bar or relax in the lounge. Located in the centre of Rémalard, this spa boutique hotel offers guest rooms with stone walls and exposed wooden beams. It features a garden, a fitness centre and a spa centre, complete with a hot tub and a hammam. All of the rooms at Coté Parc are equipped with a flat-screen TV, a DVD player and free Wi-Fi. Each room also includes a private bathroom with a bathrobe, a bath and a shower. A continental breakfast is served every morning in the communal lounge. Guests are invited to relax on the terrace with a drink from the bar. Set in the Perche Regional Nature Park, this hotel is just 16 km from Nogent-le-Rotrou and provides free private parking.
" Le 42 " B&B is offering accommodation in Nogent-le-Rotrou. The property features barbecue facilities, as well as a garden. The accommodation features a shared kitchen, and luggage storage for guests. All rooms in the bed and breakfast are equipped with a kettle. The private bathroom is fitted with a bath. All units will provide guests with a microwave. A continental or à la carte breakfast can be enjoyed at the property. " Le 42 " B&B offers a terrace. Guests at the accommodation will be able to enjoy activities in and around Nogent-le-Rotrou, like cycling. Bicycle storage is available at the property. Verneuil d’Avre et d’Iton is 47 km from " Le 42 " B&B. Featuring accommodation with a terrace, Le 42 Chambre d'hôtes is situated in Nogent-le-Rotrou. The property, housed in a building dating from 19th century, provides free WiFi. This bed and breakfast is equipped with a fully equipped kitchen, a dining area and a flat-screen TV. A continental breakfast can be enjoyed at the property. The bed and breakfast offers a barbecue. Guests can also relax in the garden. Hotel Sully is located in the centre of Nogent-le-Rotrou in the Perche Regional Nature Park, just 1.6 km from Château Saint-Jean. It offers free Wi-Fi internet access. The guest rooms at Hotel Sully are soundproofed and include a flat-screen TV and a telephone. They each have a private bathroom with a hairdryer and towels. Breakfast is served every morning at Hotel Sully. Other facilities offered include a shared lounge, a games room and luggage storage. Private parking is possible on site and Nogent-le-Rotrou Train Station is 1.2 km away. The property is a 50-minute drive from Chartres and a 1-hour drive from Le Mans. Situated 1 km from the centre of La Ferte-Bernard, this hotel offers low-cost accommodation, and a restaurant serving regional cuisine. The guest rooms are simply decorated and feature a flat-screen TV with satellite channels, a telephone and a desk. Each room also includes a private bathroom that comes with a shower, hairdryer and free toiletries. Breakfast is served every morning in Kyriad La Ferte Bernard's breakfast area.Free internet access and free parking are also offered on site. 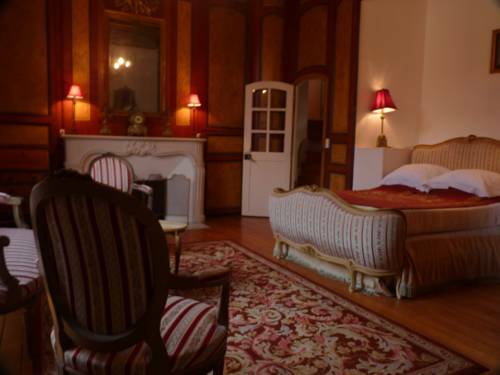 The hotel is located in the heart of the old town, a 5-minute walk from the St. Jean Castle and the Sully Tomb. It offers rooms with free internet access. All the rooms are modern in style. They come with ensuite facilities and a hairdryer. Hotel au Lion d'Or is the ideal stop between Beauce and Normandie to discover the beautiful town of Le Perche with its hills and its forests. Situated in the centre of Nogent-Le-Rotrou, near the restaurants and shops, Hotel Au Lion d’Or offers free private parking. Le Mans is 65 km away. The SNCF station is within walking distance, and the property offers free, secure bicycle storage. Providing a bar and free WiFi, Le Gouverneur provides accommodation in Nogent-le-Rotrou. A continental breakfast is served each morning at the property. Le Genty Home features accommodation in Mortagne-au-Perche. Providing a restaurant, the property also has a terrace. Free WiFi is available. All rooms in the hotel are equipped with a flat-screen TV. The private bathroom is fitted with a shower. Guest rooms have a desk. A continental breakfast is available daily at Le Genty Home. Cycling is among the activities that guests can enjoy near the accommodation. Alençon is 39 km from Le Genty Home, while Verneuil d’Avre et d’Iton is 41 km from the property. The nearest airport is Deauville – Normandie Airport, 108 km from the hotel. Hotel des Tailles features accommodation with a shared lounge and free WiFi, and is situated in Mortagne-au-Perche. There is a fully equipped private bathroom with bath and free toiletries. A continental breakfast is available daily at the bed and breakfast. A babysitting service is also available for guests at Hotel des Tailles. Alençon is 40 km from the accommodation, while Verneuil d’Avre et d’Iton is 41 km from the property. The nearest airport is Deauville – Normandie Airport, 108 km from Hotel des Tailles. In the heart of the old part of Mortagne, set in the hills of the Perche region, the Hotel du Tribunal is an authentic 16th and 18th century flowered residence. Its rooms are bright and spacious, all equipped with private bathroom and Wi-Fi access. Each room offers a view of the garden or the countryside. Regional cuisine is served in the gastronomic restaurant at Logis Hôtel Du Tribunal. Guests are advised to reserve a table in advance. Breakfast can be served in the comfort of your own room at an additional cost. Located just a few kilometres away from the city centre of La Ferté-Bernard, this hotel will seduce you with its convivial atmosphere, its comfort and its prices. In the heart of the Sarthe, near a network of canals formed by the tributaries of the Huisne, know as the Venice of the west, our town awaits you with the delight of its fortresses, canals, banks, windmills and the remarkable church, Notre-Dame des Marais, in a flamboyant Gothic style. Campanile La Ferte-Bernard is in an ideal location, 1 km from the centre of town, 5 km from the train station and directly accessible from the exit to the A11. Featuring free WiFi throughout the property, Chambres d'hôtes Saint Jean offers accommodation in Nogent-le-Rotrou, 48 km from Verneuil-sur-Avre. All rooms include a flat-screen TV. Each room is equipped with a private bathroom with a shower. Extras include free toiletries and a hairdryer. Chartres is 68 km from the property while Le Mans is 75 km away. Hôtel balladins La Ferté Bernard is 1.3 km from the centre of Cherré and 2.5 km from La Ferté-Bernard Train Station. It offers en suite rooms, free Wi-Fi access and a lift. All the air-conditioned rooms at Hôtel balladins La Ferté Bernard offer a TV with Canal + and a private bathroom with a shower. Guests are able to enjoy a buffet-style breakfast every morning at Hôtel balladins La Ferté Bernard. This hotel is 6 km from the A11 motorway, which leads directly to Le Mans. Free private parking is available on site. Situated in Nogent-le-Rotrou in the Centre region, Chambre d'Hôtes "Orchidees" has a terrace. This bed and breakfast provides a garden. This bed and breakfast comes with a dining area, a kitchenette with a microwave, and a flat-screen TV. A Full English/Irish breakfast is available each morning at the property. Guests can also relax in the shared lounge area. L'Epine is set in Saint-Rémy-du-Val. The accommodation is 47 km from Le Mans. The holiday home is composed of 3 bedrooms, a fully equipped kitchen, and 1 bathroom. The holiday home offers a barbecue. L'Epine offers a terrace. Alençon is 15 km from the accommodation, while Argentan is 47 km from the property. Located in Saint-Aignan in the Pays de la Loire region, Gite De Caractère features a terrace. Guests staying at this holiday home have access to a fully equipped kitchen. The holiday home features a TV. Guests can relax in the garden at the property. Le Mans is 30 km from the holiday home, while Alençon is 39 km from the property. Offering free WiFi and lake views, A deux pas de l'étang is an accommodation set in Coudray-au-Perche. Guests staying at this holiday home have access to a fully equipped kitchen and a terrace. This holiday home with garden views features 2 bedrooms and 1 bathroom with a shower. A flat-screen TV is available. Providing a garden, La Valise A Cheval offers accommodation in Mézières-sur-Ponthouin. An American breakfast is served each morning at the property. There is an in-house restaurant, which specialises in American cuisine. The bed and breakfast offers a terrace. If you would like to discover the area, cycling is possible in the surroundings. Le Mans is 28 km from La Valise A Cheval, while Alençon is 45 km away. Offering free WiFi and garden views, Holiday home Manoir de Courcelles is an accommodation situated in Coudray-au-Perche. This holiday home offers barbecue facilities. This holiday home features a living room and a fully equipped kitchen with a dishwasher. A TV is provided. Below here is the hotels map of Appenai-sous-Bellême. Names and details of Appenai-sous-Bellême hotels can be shown on the map clicking on the prices icons.